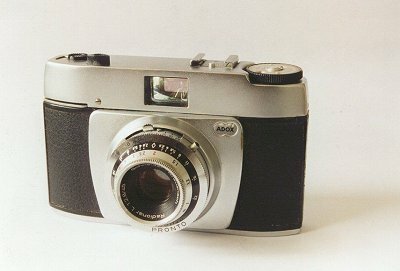 This camera is similar to my first camera, that I used about 1970. In those days I could not afford it to buy a new camera, so I bought a seccond-hand one. Lateron I exchanged it for a Yashica. This Adox Polo I bought in Doesburg in August 2000. Voor 69 gulden (incl. paraattas) heb ik op 7/9/1961 een Adox Polo gekocht. Daarmee ongeveer 20 jaren gefotografeerd. Uiteindelijk weggedaan omdat het transportmechanisme steeds vaker weigerde. Reden voor deze mail: in tegenstelling tot uw gegevens, bezat mijn Polo een lens met een sterkte van "slechts" 3,5. P.s. : het instructieboekje bezit ik nog. There has actually been at least three "Polo 1" models, none of them with a conspicuous Polo logo. The "Polo 1" models have the 3.5/45mm Schleussner Adoxar and a Prontor 125 shutter. The early Polo 1 has a plain viewfinder, the later model already has a brightline finder, which explains the confusion with the 1s model (brightline finder, Schneider Radionar L lens, Pronto shutter with selftimer). While stationed at Evreux AFB in 1963, I purchased, 2nd. hand, an Adox 300. This is a manual f2.8 to 22, B - 1/500sec focal plain shutter. Camera has an interchangable magazine, you can load 2 kinds of film and before either is exhausted you can switch out magazine. Load one B/W other color then have at it. Camera is in operational shape, just the case is a bit worn. You speak all Muslims are terrorists, but really few of the are terrorists. The Media want to show us they are evil… USA Government is evil!The United States is destroying Iraq and it is giving billions to the Ethnic Cleasing of Pae&tsinel#8230; May I say the American people are terrorists? You can’t blame the Muslims for terrorism and you can’t blame blame the American people for the despotic and cruel government they have (cruel for the Arabs and some others).